Death the Kid has an obsession with the colors black and white and with symmetry. All of these quirks are of course very much implemented into his outfit and look. He has a sort of uniform for himself that consists of a black suit with asymmetrical white trim and white accents. 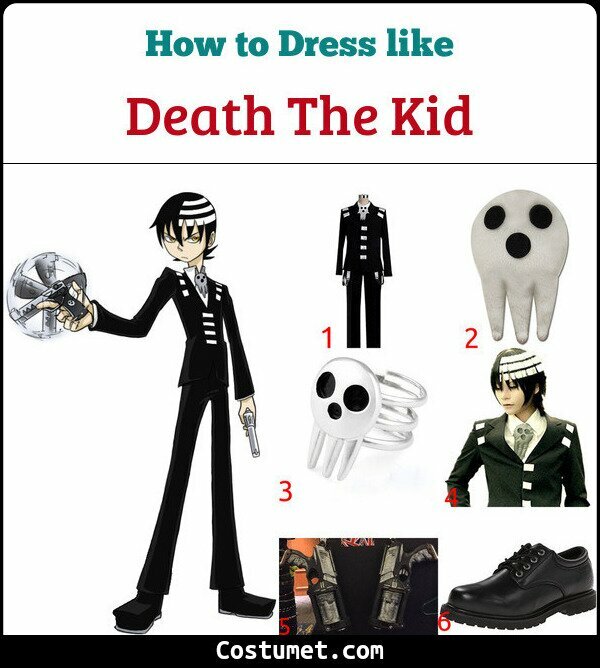 The uniform looks very chic and modern on Death the Kid, despite it’s somewhat boring quality. He also wears a lot of Death’s logo on him, like on his two silver rings and on his neck clip. His hair is black with three white symmetrical stripes on one side of his head, furthering his very symmetrical look. Most importantly, he has two guns that are humans named Liz and Patty from whom he gets his powers from. 1 Suit, black & white Death the Kid has a sort of uniform for himself. You will never catch him dead outside of his black and white, very symmetrical suit. 2 Clip, skull This skull is Death’s logo, so as his child, Death the Kid supports it as well. He wears this skull neck clip right on the front of his suit. 3 Rings, skull, silver He wears two rings, one on a finger of each hand. The rings of course have the same skull logo as his neck clip does. Death the Kid is all about symmetry, so two rings is a must. 4 Wig, black & white His hair is your typical black anime boy hair, except that he has three thick white stripes around one side of his head. The stripes are very symmetrical and parallel. 5 Guns, costume Death the Kid’s guns are very important because as a weapons meister, he is very close to his human weapons, Liz and Patty. They give him power and the ability to use his guns. 6 Shoes, black On his feet he wears plain, but chic black dress shoes that make his outfit stand out and keep him looking fresh. Death the Kid is a weapon meister student in a Shinigami technical school. He is Death’s actual child, as you can tell by his name. He is one of the important main characters in the spectacular anime Soul Eater. Death the Kid has a very nonchalant personality, unless you mess with his symmetry. He is voiced by Japanese voice actor Mamoru Miyano.